215 pages | 24 B/W Illus. Fueled by corruption, fraud, and organized crime, the shadow economy—also known as the informal, black market, illegal, or underground economy—is currently on the rise worldwide. 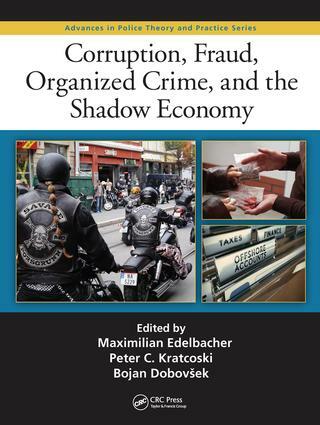 Corruption, Fraud, Organized Crime, and the Shadow Economy addresses shadow economies and the players involved by examining various aspects of criminal law and prosecution. This book gathers the insights of several world-renowned professionals and academics in order to portray the links between organized crime, the shadow economy, and corruption. It discusses how to address these issues as they relate to crime, criminal law, and prosecution of the players involved. The constant misconception by policy makers of the relationships between organized crime, corruption, and the shadow economy fuels the present status quo of economic inequality, increases the risks of future economic crises, victimizes people, and even damages the environment. This book takes a critical, multinational, multidisciplinary, common-sense approach to complex and globalized problems of conventional and unconventional deviance through the shadow economy. The contributors identify key critical areas in specific countries from which they originate, adding an insider’s perspective to their analyses. With these insights and the use of illustrative case studies, they highlight best practices as well as mistakes to avoid in encountering the obstacles that lie ahead in combating the shadow economy. Bojan Dobovšek is a member of the Slovenian parliament and a full professor on the faculty of criminal justice and security at the University of Maribor, Slovenia. He earned his PhD in criminology from the University of Ljubljana, Slovenia. He is the author of a book on organized crime and terrorism and editor of several publications on corruption and organized crime. His research focuses on corruption in state institutions, corruption networks, organized crime and terrorism, economic and financial crime, migration problems and human trafficking, and art crime investigation. He served on the Commission for the Prevention of Corruption and is currently completing research on ecological crime. He is a partner of the Institute for Politikwissenschaft und Sozialforschung, University of Wurzburg, Germany, and a visiting professor on faculties in Ghent, Sarajevo, Belgrade, and Zagreb.